Long-Term Quality Alliance (LTQA) is a community of organizations aimed at improving outcomes and quality of life for persons who are managing functional limitations due to chronic health conditions, and their families. It draws member organizations from the full range of health care and social services delivery systems involved in provision, administration, innovation, policymaking, and advocacy for quality long-term services and supports (LTSS). Organizations come together in the Alliance to share knowledge and experience needed to advance development and continuous improvement of high-quality systems of integrated, person- and family-centered LTSS. The Alliance serves as a convener of disparate private-sector and governmental organizations, with an eye to identifying and resolving the most significant challenges and advancing the replication of successful models that demonstrate the potential for more widespread adoption of person-centered LTSS integration. Vision: A future in which people with functional needs have access to affordable, high-quality, coordinated, person- and family-centered LTSS, provided in the settings they and their care partners prefer. Convening stakeholders around innovative models that achieve better outcomes, reduce expenditures, and provide a platform for financing LTSS by integrating medical care, behavioral health, and LTSS. The Long-Term Quality Alliance (LTQA) was launched in 2010, and operated in its early years as part of and with support from LeadingAge. The Alliance was originally conceived as a vehicle to advance recommendations to improve long-term care quality reported from the National Commission for Quality Long-Term Care. The Alliance participated initially, along with three other sector-specific quality alliances, in the Quality Alliance Steering Committee, chaired by Dr. Mark McClellan at the Brookings Institution. 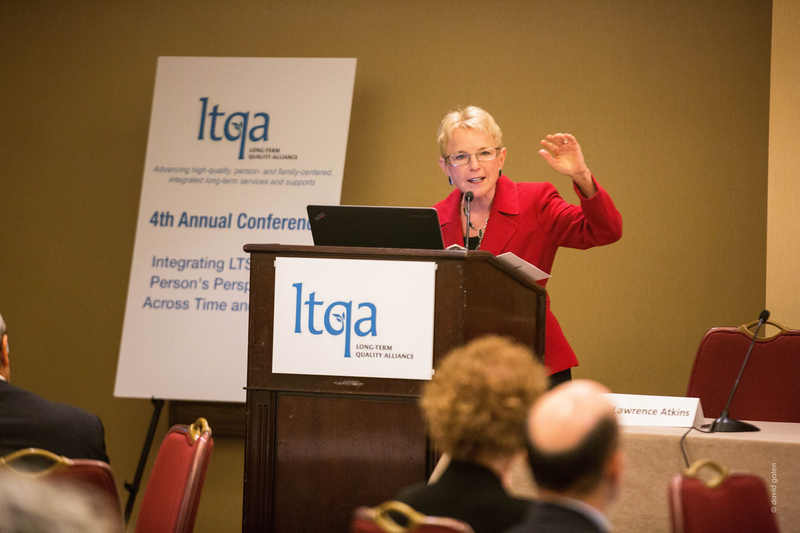 In its early years, LTQA focused on identifying and promoting best practices in care coordination and care transitions that improved access and quality of care, and on developing collaboration within and among communities working on these issues. Its Innovative Communities Initiative (ICI) convened three ICI summits over its duration. LTQA also convened a series of Annual Meetings, beginning in 2011, focused on care transitions, care coordination, and integration. In 2013, the Alliance was incorporated as an independent, non-profit, tax-exempt organization and in 2014 moved to its own offices. LTQA broadened its Board and Advisory Steering Committee to engage a wider array of stakeholders in its work. In June 2017, the LTQA Board of Directors adopted amendments to the Alliance’s Articles of Incorporation and By-laws, which transformed the organization into a membership organization. Since becoming a membership organization, LTQA has brought in additional LTSS stakeholder organizations broadening its array of providers, consumers, payers, researchers, and foundations involved in the world of long-term services and supports (LTSS). The Alliance’s diverse membership is a great asset that gives it the ability to address policy and practice across a wide range of issues. An important step toward its long-range vision is to become the “Big Table” for LTSS – where the spectrum of relevant stakeholder groups interact to advance improvements in service delivery, quality, financing, and the public policy framework that shapes the system. Today, LTQA fills a valuable role in the LTSS sphere as a convener of key stakeholders and leading thinkers in LTSS around projects and activities that tangibly advance thinking and action toward our goals. The Alliance is aimed at advancing high-quality, person- and family-centered, integrated long-term services and supports through projects involving research, analysis and policy, and advocacy. The movement toward integration of medical care, behavioral health, and LTSS, centered on the person and family, offers a framework for making significant gains on long-standing problems with access to home and community-based LTSS, post-acute care transitions and readmissions, coordination of medical care and social services and supports, quality of community-based services, and LTSS financing. The potential for slowing health care cost growth rests on developing more effective ways to manage care and improve the health of the population with high healthcare needs and costs. Successful early intervention, targeted on the basis of functional limitations rather than health care needs, can be most effective at lowering costs and improving outcomes. Managing a system of coordinated medical care and social services based on an individual’s own goals and preferences can reduce the need for expensive medical care, lower overall care costs, and improve outcomes. To make the investment in social services and supports viable financially, however, the added costs of services have to be paired with the reduction in health care spending. Full integration of medical and non-medical services funded by a single capitated premium provides both the incentive and the tools to achieve substantial savings and improve quality of life for high-cost, high-need individuals. The reality of LTSS integration is a long way from the vision of a fully-integrated future. There are relatively few successful models of full integration available today and few of the models that are successful have the capacity to scale up sufficiently to become a norm for how care is financed and delivered. Before any of the service delivery improvement and financing solutions dependent on LTSS integration can take place, integration itself needs to become a widespread reality. LTQA’s vision of the path to this future starts with projects that help build the foundation for LTSS integration, help scale up small successful models of LTSS integration, encourage large, well-resourced organizations to pursue LTSS integration on a large scale, and generally accelerate the pace of change toward widespread, LTSS integration.